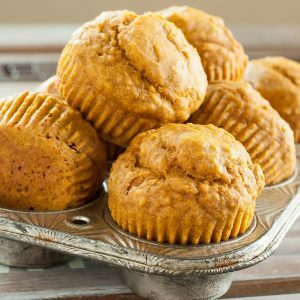 We love making these kid-friendly pumpkin muffins. They're super simple, gloriously healthy, and sweetened naturally with maple syrup! Line a muffin tin with parchment paper baking cups or spritz with your favorite oil spray. I used parchment liners for uber-easy clean up and zero sticking! In a medium bowl, combine flour flax, baking soda, baking powder, cinnamon, and salt and mix. In a larger bowl, combine lightly beaten eggs with milk, maple syrup, melted butter, vanilla and pumpkin. Whisk until incorporated.. Slowly sift the flour mixture into the egg mixture, using a fork to mix in a clockwise motion. Once the mixture is just combined, scoop into muffin cups, filling each about halfway. Bake at 350F on the center rack for approximately 14-16 minutes, inserting a toothpick into the center to check for a fluffy, full-cooked interior. Remove muffins from tray and allow to cool on a wire rack until they're cool enough to eat. Dig in! Store remaining muffins wrapped on the counter for up to four days or in the freezer for a month. Enjoy! If you’re feeding them to kiddos like moi, I suggest leaving them just barely sweetened as written in the recipe. Trying to trick adults? You may need a little extra sweet stuff to appease their sugar-lovin’ palate. 2-3 tablespoons of brown sugar should do the trick! Sometimes I'll sprinkle a little cinnamon sugar on softened butter as a spread if I'm in the mood for a little extra sweetness. Anything goes!